In today’s technological climate, credit unions are competing on two fronts: first, their member financial products services must compete with those offered by other financial institutions. Second, their mobile support and online platforms have to compete against tech giants like Amazon and Netflix for ease of use, user experience, and functionality. It doesn’t matter if a member is out of town, in a business meeting, or just doesn’t want to put on their shoes—credit unions should be prepared to provide the same kind of excellent support and experience online as they do in their physical branches. Mobile banking, remote loan applications, and online account creation or management are critical for success among today’s financial institutions. If I’m at home and want to check my personal account, I want it to be as fast and easy as it would if I put my pants on, walked into my branch, and spoke with an employee. If I’m trying to pay bills, finance new equipment, or inquire about a property loan for my business, I want to do it even if my meeting ran late or if I’m at a conference in Montserrat. Remaining within a stone’s throw of the technological edge is key for your credit union. Digital transformation means expanding your products and services to engage with the online- and mobile-savvy users who expect the same sophistication and level of service from your credit union as they do from any other business in the digital age. 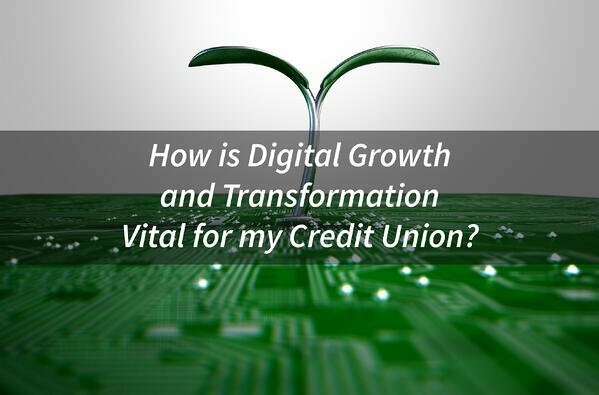 For a credit union, digital transformation can take a lot of time and resources. It requires a change in mentality and culture, perhaps a few key partnerships with strong fintechs, and big arms with which to embrace our new robot overlords.